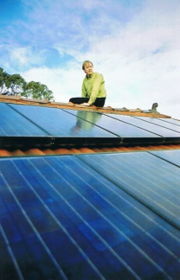 Solar panels convert sunlight to electricity with zero carbon emissions. The "embodied energy" of a solar panel is recouped by approximately 18 months of operation in a sunny climate such as Australia, and 2.5 years in Europe. A solar array cleanly produces electricity when the sun is shining and any surplus electricity can be exported to the grid. At night, when the sun does not shine, electricity can be imported back from the grid. An alternative arrangement is the installation of batteries, which store the electricity generated during the day for use at night. The power from the solar module is proportional to the amount of light shining on it. The key requirement for a suitable solar site in Australia and elsewhere in the Southern Hemisphere is a north facing roof or ground space that is not shaded during the day. In the Northern Hemisphere south facing roof or ground space is required. This page was last modified 04:03, 16 August 2008.